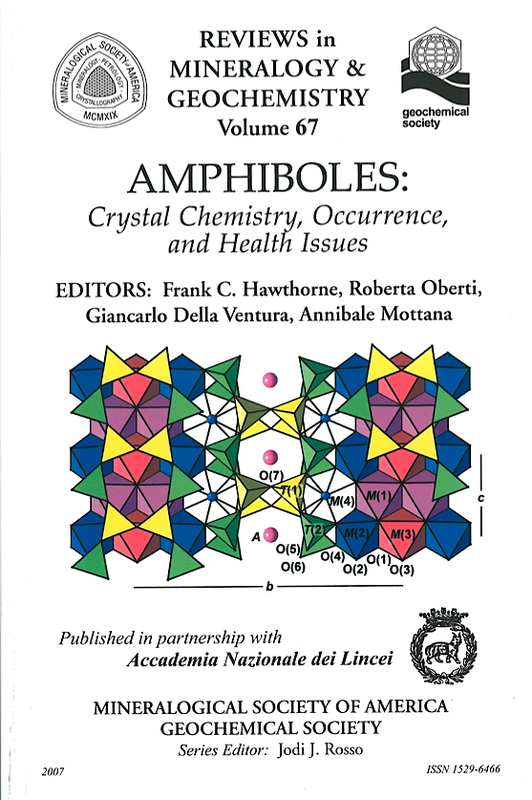 Over 25 years ago, Volume 9 of Reviews in Mineralogy: Amphiboles and Other Hydrous Pyriboles seemed to contain all that was possible to know about this group of fascinating minerals. The subsequent twenty-five years have shown that this assessment was wrong: Nature was keeping a lot in reserve, and has since revealed considerable new complexity in the constitution and behavior of amphiboles. Some of the advances in knowledge have been due to the use of new experimental techniques, some have been due to the investigation of hitherto neglected rock-types, and some have been due to the development of new ideas. The identification and systematic investigation of variable LLE (Light Lithophile Elements), particularly Li and H, led to the identification of several new amphibole species and the recognition that variable Li and H play an important role in chemical variations in amphiboles from both igneous and metamorphic parageneses. In turn, this work drove the development of microbeam SIMS to analyze LLE in amphiboles. Detailed mineralogical work on metasyenites showed hitherto unexpected solid-solution between Na and Li at the M(4) site in monoclinic amphiboles, a discovery that has upset the current scheme of amphibole classification and nomenclature and initiated new efforts in this direction. Systematic and well-planned synthesis of amphiboles, combined with careful spectroscopy, has greatly furthered our understanding of cation and anion order in amphiboles. The use of bond-valence theory to predict patterns of SRO (Short-Range Order) in amphiboles, and use of these predictions to understand the infrared spectra of well-characterized synthetic-amphibole solid-solutions, has shown that SRO is a major feature of the amphibole structure, and has resulted in major advances in our understanding of SRO in minerals. There has been significant progress relating changes in amphibole composition and cation ordering to petrogenetic conditions and trace-element behavior. Work on the nature of fibrous amphiboles and their toxicity and persistence in living organisms has emphasized the importance of accurate mineralogical characterization in environmental and health-related problems. The current volume has taken a different approach from previous volumes concerned with major groups of rock-forming minerals. Some of the contents have previously been organized by the investigative technique or groups of similar techniques: crystal-structure refinement, spectroscopy, TEM etc. 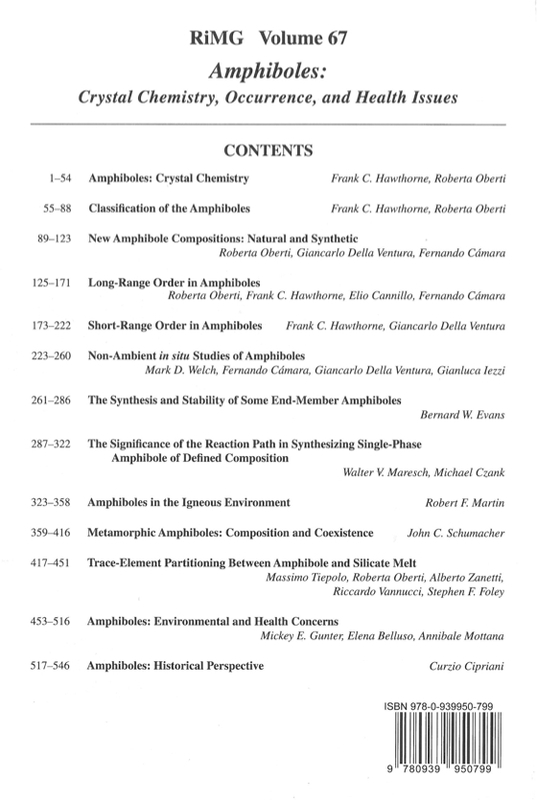 Here, we have taken an approach that focuses on aspects of amphiboles rather than experimental techniques: crystal chemistry, new compositions, long-range order, short-range order etc., and all experimental results germane to these topics are discussed in each chapter. The intent of this approach is to focus on amphiboles, and to emphasize that many techniques are necessary to fully understand each aspect of the amphiboles and their behavior in both natural and industrial processes.